If you looked up “feeling alive” in the dictionary, you might see a picture of person snowshoeing. 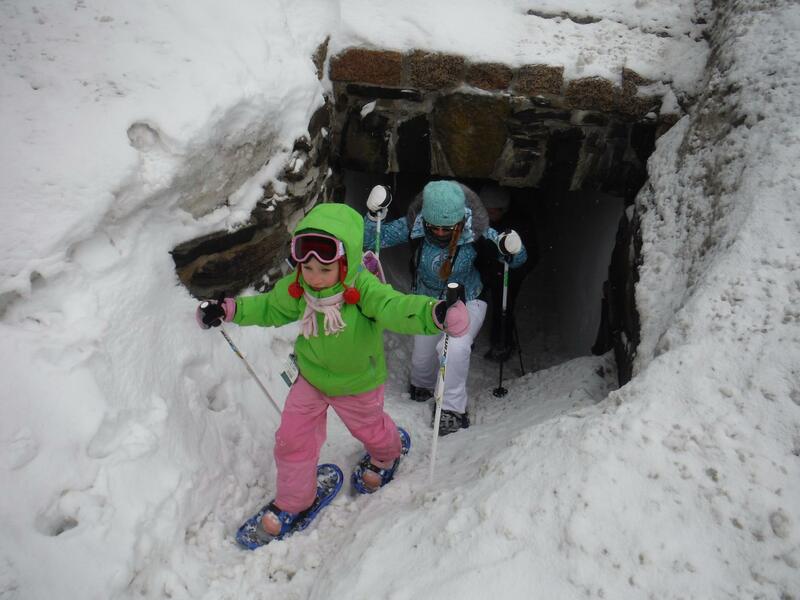 It’s certainly a great way to make winter fun while getting fresh air and exercise. 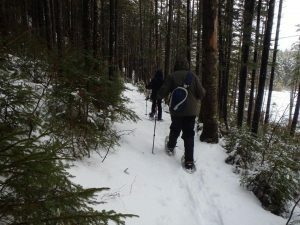 For you this activity can be an easy and relaxing tromp through beautiful, snow-laden forests just full of sparkle and wonder, or it can be a full-on snowshoe hike of a NH 3-4000-footer, it all depends on what you desire. The day, after all, is yours. In any case, we hope you’ll join us. With our intimate knowledge of the area, we have a huge selection of snowshoeing offerings: sunrises, sunsets, frozen waterfall excursions, mountain views, secluded forest treks through pristine woodlands, even summit attempts to various mountains large and small including our very own 4000-footers. 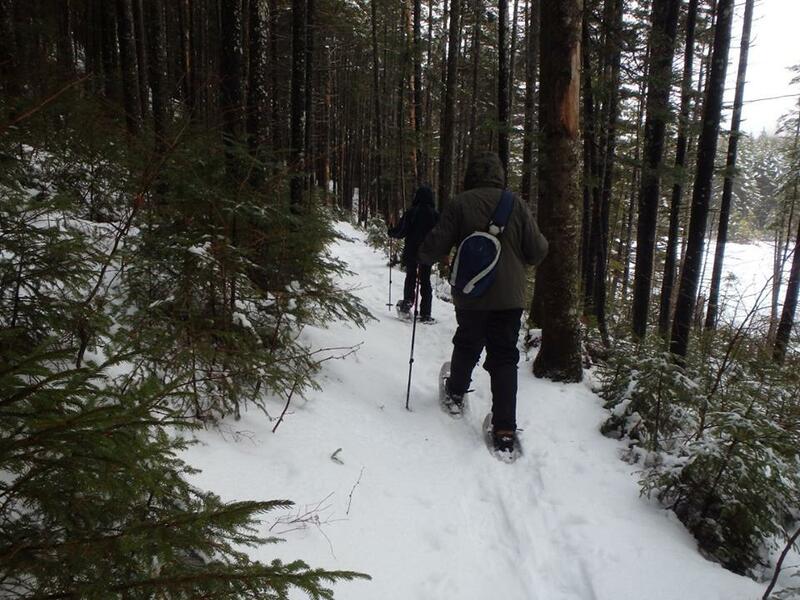 Our snowshoeing offerings begin with a half day, lasting 3-4 hours or so. We can double, triple, even quadruple this as needed, depending on your objective. A typical 3 to 4000-footer, for example, would be a very full day lasting 6-8 hours or so, while some 4000-footers, especially in winter, may be a lot longer — and we do offer extended (9-12 hour) and hyperextended (12-16 hour) snowshoe hikes for those who have lofty goals like winter Bonds traverses (ask for pricing). Please include any special objectives or desires you may have, if applicable, in the comments box of our Booking Form. Think layers. While a ski jacket, for example, may be warm and waterproof, if the insulation can’t be separated from the rain/snow protection layer, it really isn’t suitable. 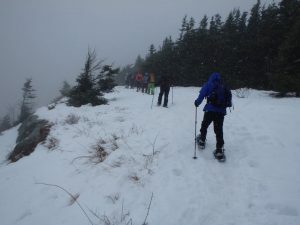 You will overheat if you need rain/snow protection while snowshoeing. Bring independent layers. Having our “Ready Pack” will solve the matter offering all you will need. Never wear cotton, even at the underwear level. Synthetic materials, wool, and especially performance/wicking materials should be your clothing of choice. For snowshoeing, since cotton won’t dry and doesn’t insulate while wet, it can pose a hazard. You will want to wear the right type of sports or hiking clothing and you will want to bring extra. Bring more than you think you need. Mountain weather can be very tricky and unpredictable. While it may be nice in town, the mountains can be very different. Being prepared can save your life. For footwear, wear winter-rated hiking or mountaineering boots. And speaking of winter, notably above treeline, you will want to prep for Denali. On some days. Seriously. Adding gear such as the following as a minimum is expected: Heavy-duty hooded parka, overmitts with liners, mountaineering boots, balaclava, and a set of goggles. 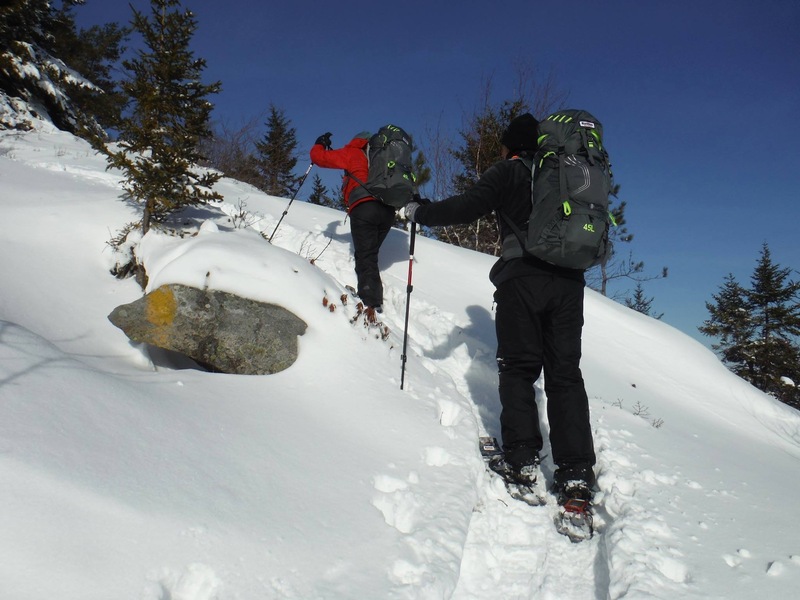 For your snowshoeing gear needs, in addition to your own non-cotton base layers, hiking/climbing pants with shirt, and footwear, as described above, we offer three options. Click to expand. Seasonal specialty clothing (see information above). SPECIAL NOTE: You may get a “Ready Pack, Lean” without food and water for $30/person/day. A lined pack with hip belt and room for the items below (~30-40 liters). Rain jacket and pants, or rain poncho (mountain weather can be quite wet). Whistle or sound-making device (sternum strap whistles are okay). Tarp, bivvy, or personal shelter. A lightweight emergency sleeping pad. Trekking poles, Gaiters, Microspikes, $15/set/person/day (ice season). Trekking poles, Gaiters, Microspikes, Strap-on Crampons, $25/set/person/day (ice season). 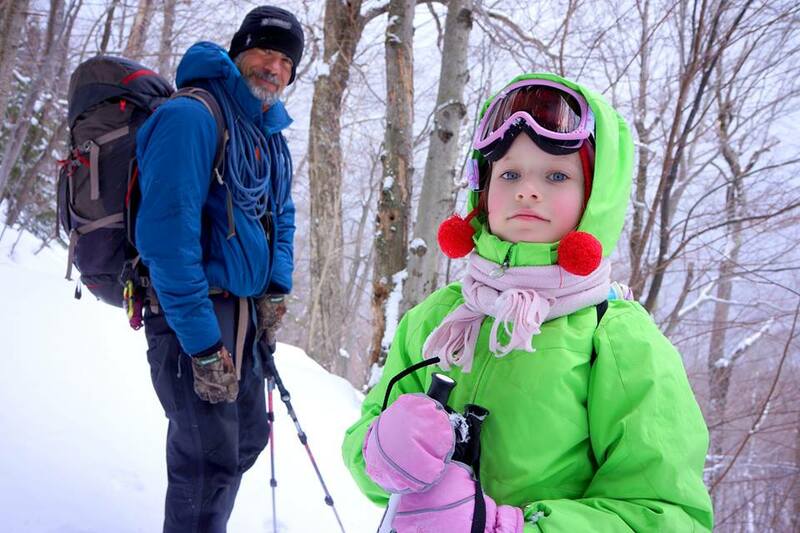 Balaclava, Goggles, Mitts, $15/set/person/day (alpine). Down blend puffy, $25/person/day (deep cold). SPECIAL NOTE: If any outsourced gear such as mountaineering boots is needed, as might be the case on above treeline, snowshoe hikes, we can rent it ahead of time for you for $40 plus the applicable rental fees. Bring everything and rent nothing. In which case, you will need everything from the above lists appropriate to your activity, time of year, and expected conditions. Contact us if you have questions, mention it on the booking form, or simply note it when we call to finalize your booking. The difficulty of this activity is as requested. This activity has a 1:4 guide/guest ratio. Not ready for this? 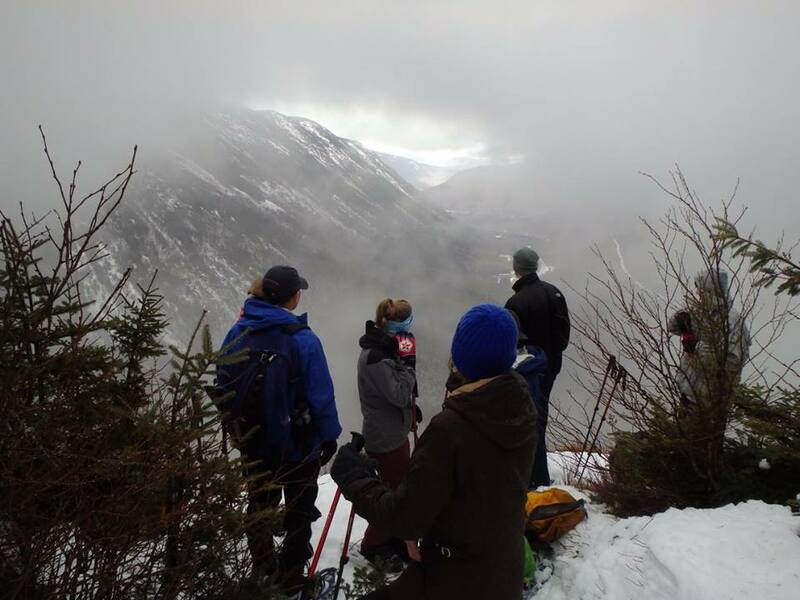 Try out our Hiking Intro or Winter Skills courses. Otherwise, go ahead and BOOK IT NOW! 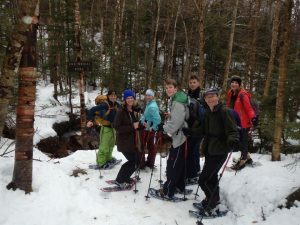 Below are photos from previous snowshoe excursions. Click on the photos to enlarge them.